Unique design using building blocks make it permanent. It is easy to disassemble. The best part is that it can be assembled in 2 hours with the help of 2 men. You can be ready to BBQ by lunch time. 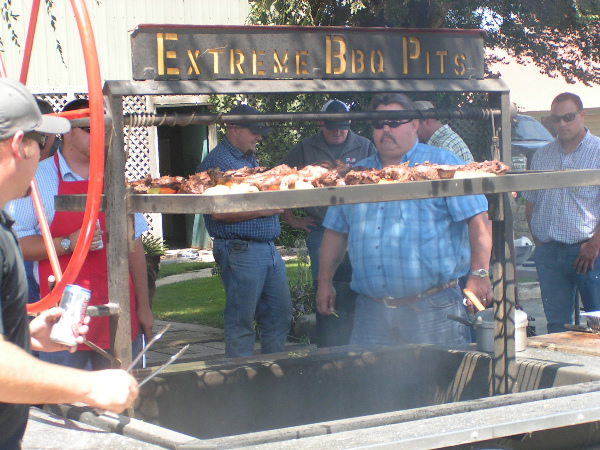 Extreme BBQ Pits is proud to offer home delivery and set-up for a nominal fee. If a tow behind BBQ is much more than what you need for your own backyard, Extreme BBQ Pits also makes a custom free standing BBQ Pit Frame. The BBQ pit frame is available in two Big Dog sizes. Both grills are available with stainless steel rods or expanded metal. You choose your style. If you are looking for a Santa Maria Style wood burning Bar B Q pit this is your place. You dream it and the Extreme BB Pits team can create it. What are you waiting for? Start creating your custom BBQ pit today, you'll be happy you did. If you have any questions, contact us at 831-674-2053.